Perched above the bay of Agios Lazaros and with extensive views over the waters southwest of Mykonos, 9202 is a charming property part of a large exclusive resort placed in a magnificent waterfront position. 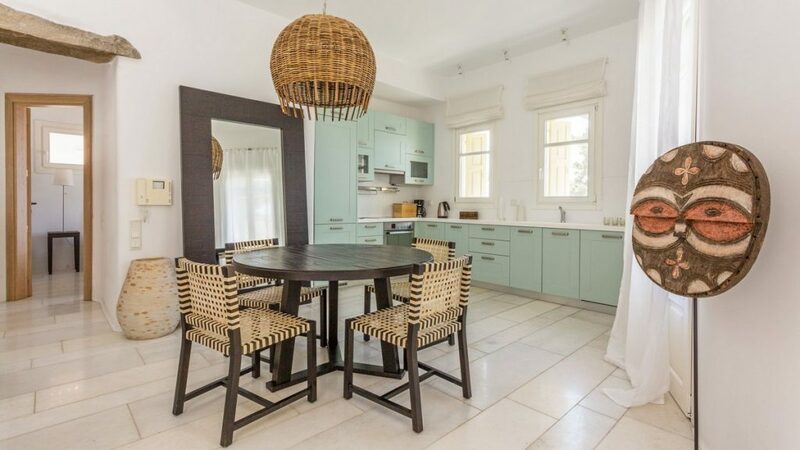 The position of the property assures tranquility away from the crowds while being within easy reach of the beaches of Psarou and Platy Gialos as well as the vibrant Chora of Mykonos. An elegant infinity pool surrounded by summer furniture dominates the villa’s terrace well accompanied by a covered pergola providing shading for the outdoor dining area, ideal for meals enjoyed with the sea’s turquoise waters as a background. Upon entering the property one is greeted by the cozy living room, which through the large windows and French doors allows the same view as the outdoor spaces. The main floor of 9202 also features the villa’s fully equipped kitchen as well as a guest bedroom. Two well-appointed guest bedrooms sharing a spacious common bathroom are located on the lower level of the property while the master bedroom is located on a higher level, which is entirely devoted to this room’s space. 9202 is ideal for smaller groups who are looking for a property, which offers all necessary amenities combined with quality finishing and generous views of the Aegean sea, all while holidaying on one of the most exclusive resorts on the island. 4 hours daily maid service, change of bath & pool towels daily, linen twice weekly.